The Boonsung Wreck is often described as ‘Fish Soup’. The density of marine life here is often better than most dive sites in the Similan Islands. An old tin mining vessel, surrounded by sand for miles in every direction, provides the perfect protection for thousands of juvenile fish. The schools of fish are huge and the variety of Macro life is one of the best in Thailand. This is a real divers dive site and part of a fascinating history of Tin mining in the Phuket and Khao Lak area. 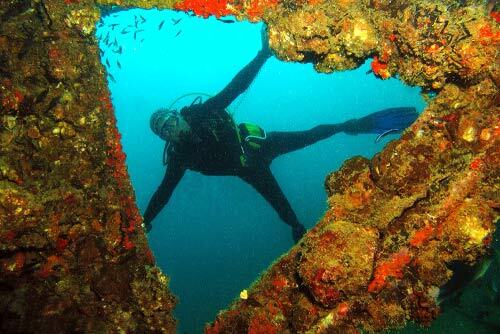 The Boonsung Wreck is located about 5km West of Bangsak beach, to the North of Khao Lak. Visibility is typically not as good as the Similan islands. However, the huge variety of marine life makes it well worth seeing. It is a regular final stop on many Similan Liveaboards, although it is technically not part of the Similan islands. The Boonsung wreck also makes for an excellent and speedy day trip by longtail. The Boonsung Wreck is the best value dive around Khao Lak. The wreck was on old tin mining vessel owned by the Bonsoong tin mining company. The legend goes that it sank due to a faulty toilet mechanism. After it sank in 1979, it was bombed by the Thai Navy as it sat so close to the surface. It also took a hit from the 2004 Tsunami and was broken up into even smaller pieces. Now it is unrecognisable from the original structure, but has become the perfect home for much marine life. At between 14m-19m, with very mild currents, the Boonsung wreck is perfect for beginners. Just be careful with your buoyancy and try not to touch anything. Rusty metal, Lionfish and Scorpionfish are just a few of the hazards here. There is so much life here that you can easily do two dives. Also, a sandy bottom can even make it possible to do the last two dives of your Open Water Course. Experienced divers can appreciate some of the best macro life in the area. A huge variety of colourful nudibranchs are reason enough to spend a few dives exploring here. Look for Ornate Ghost pipefish, Frogfish, Stonefish and dozens of juvenile fish species. There are also Moray eels all over the site including the smaller white-eyed Moray and the beautiful (much rarer) Honeycomb Moray eel pictured above. The dive site is most impressive and most famous for its vast array of marine life. It can be roughly split into two categories; the huge schools of fish and the tiny macro life. For a great dive, make sure you spend some time looking at both. As you descend you will see huge schools of Snapper, Forsters Barracuda, Fusilier and even schooling Pufferfish. Spend some time swimming inside the schools before descending to the bottom. Look for much smaller creatures hiding in the cracks as you move around the dive site, then save a few minutes at the end to have a last little swim inside ‘fish soup’. Conditions here are usually much calmer than further out to sea and currents are typically very mild to none. This is the probably one of the easiest dives, with the calmest conditions, in the Khao Lak area. The water is often not very clear here, so wide angle photography can be quite difficult. With such a variety of Macro life here it is probably better to focus (pun not intended) on the close ups. Even if you have a Wreck specialty qualification, it is still not a good idea to penetrate the Boonsung. There are several areas with large openings that can be tempting to have a look inside, but it is not safe. After diving on the Wreck for many seasons, every year we notice another small area that has collapsed. If you venture inside then your bubbles and fins may be adding an extra stress on the already weakened structure. Stay outside of the wreck; there is already plenty to see here. The most important part of the dive is finding the wreck. There are several buoy lines attached to the wreck and you should use them. If you do a free descent with nothing in view then you may get lost fairly quickly. Descend down the line until you can see the wreck and then keep it in sight for the entire dive. 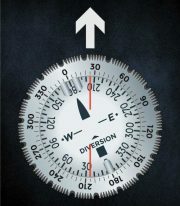 Navigation is easy as long as you stay near by. As you descend you will likely be greeted by the massive schools of snapper, fusilier and barracuda. Spend some time just swimming around inside the ‘Fish Soup’. After a while descend to the bottom and then continue to navigate your way around the wreck. The easiest way to get around is to follow it around either clockwise or anticlockwise. This way you finish in the same place you started. If you swim at a fairly slow pace you will get all the way round the wreck in around 45 minutes. If you have two dives here then slow down your dive to a nudibranchs pace and give yourself more time to search for all the macro life. Do not penetrate the wreck at any point. The structure is not stable and this could be dangerous. Stay on the perimeter of the wreck. Be careful of your buoyancy and watch where you are kicking your fins. Lots of old rusty metal and marine life including hundreds of scorpionfish, lionfish, sea urchins and more can all pose as hazards. Also, try to keep your fins off the bottom. Kicking up the sand can reduce the visibility and spoil other peoples dives. One of the best parts of the dive site is known locally as ‘Nudibranch Hotel’. This large section to the North West is home to dozens of species of sea slugs and nudis. However, you will need to have a keen eye. Several of them are brightly coloured but other are camouflaged very well on the rusty metal surface. A nudibranch enthusiast could spend the entire dive on this one section of the boonsung wreck. As you come to finish your dive it is nice to spend a few last minutes swimming inside the giant schools of fish. Then as you ascend, swim away from the wreck. Make sure someone in your group has deployed a safety marker. Sometimes the dive site can be busy with both Similan Liveaboards and longtail boats doing day trips from Bangsak beach. Descend down the South line until you can see the large metal ‘X’ structure. Proceed to follow the wreck in a clockwise direction. Swim slowly and make sure to look in all the holes and cracks if you wish to find the best Macro life. Use this compass head to get from the buoy line on the North West corner to the small artificial reef. Finish at the same place you started. If your boat is attached to the line then do your safety stop there. Otherwise start to swim away from the Wreck. The existence of Tin in the Khao Lak and Phuket area has been known for centuries. Actively searching for Tin in the ocean began in 1909 and ran all the way up till 1992, when the last Tin factory closed in Phuket. When Tin is smelted with copper it can be used to make bronze. In the last few decades, more modern composites have replaced these alloys and forced the decline of the Tin industry. However, for a long time, the Tin industry was booming in Khao Lak. Tin plays a huge part in the history of Khao Lak and Phuket. What used to be small fishing villages quickly grew with the arrival of Chinese traders and entrepreneurs at the end of the 19th Century. If you are looking for a bit of culture, there is a wonderful depiction of this in the Siam Niramit show in Phuket. One act depicts Chinese entrepreneurs arriving on the southern shores of Thailand with a host of exotic goods. At the end of the act, one Chinese trader jumps off the boat as they are about to depart and then kisses and hugs his new Thai girlfriend. This one Chinese man represents the massive influx of Chinese immigrants that arrived here over 100 years ago. Even today the population of Phuket and Khao Lak is around 35% Chinese-Thai. This marked the beginning of the Tin mining industry, a precursor to the Boonsung wreck, and had a huge effect on both land and sea. The Bonsoong tin mining company used older mining vessels. More modern vessels were much larger and more efficient. Ban Nam Khem pier, in 1989, overun with huge mining barges. Today Ban Nam Khem has little more than a few fishing boats. For good or bad, tin mining has had a huge impact in the Khao Lak area. Factories and mines in Phuket devastated the natural beauty and have had a big environmental impact. The story in the sea is a similar one. In 1989, only a few years before the decline of the industry, Jacque Cousteau made a documentary showing the impact of Tin mining in the sea. They showed the inevitable effects of hundreds of ships with huge drills ploughing the sea floor for nearly a century. If there ever were coral reefs off the coast of Khao Lak, it is no surprise that now there is only sand. Today Thailand is forced to build artificial reefs to act as a defense against coastal erosion and natural disasters. Ironically, ships like the Boonsung Wreck that ripped up the sea floor, now act as marine sanctuaries and are the areas best local dive sites. It appears that the best ecological thing these ships ever did for Khao Lak, was to sink. Ore is sent up to be processed and the waste dumped back into the sea. Tin mining surely contributed to some environmental problems, but it has at least created some wonderful dive sites. Two of the most famous wrecks, the Premchai and the Boonsung, are both Tin mining vessels. The Boonsung wreck is probably the better of the two as it has been down for much longer and the ecosystem has had more time to grow. The Boonsung wreck, also know as the Bangsak wreck, is a brilliant dive. In the 2015-16 season it was even home to three large cobias and had Whale Shark sightings more regularly than Richelieu Rock. The wreck attracts lots of life and no matter how experienced a diver you are, you will probably find something here that you have never seen before. The Boonsung Wreck is available as a short day trip with two dives or as the final dive on a Similan liveaboard. Please contact us for more information. Many strange creatures, like the Chromodoris annulata, have made the Boonsung Wreck their home.